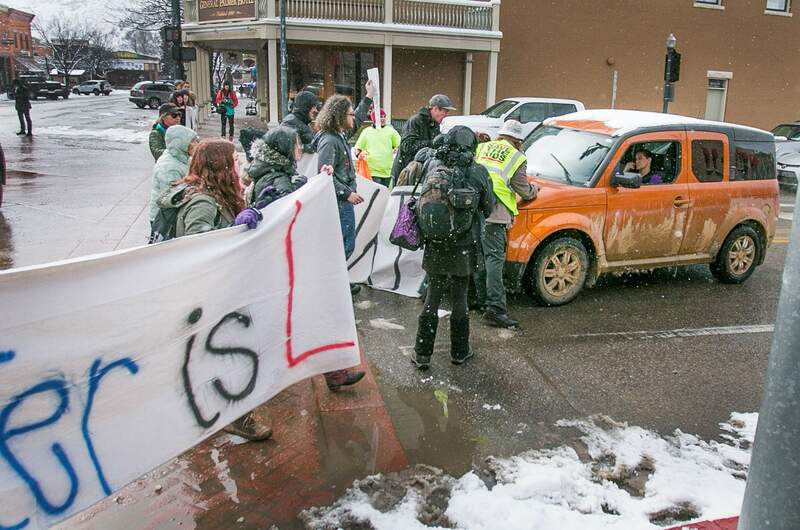 Fort Lewis College assistant professor Anthony Nocella was cited with parading without a permit and obstructing traffic in connection with a protest Jan. 20 in downtown Durango to mark the inauguration of President Donald Trump. Those charges were dropped Friday. A woman attempts to drive her car through a line of protesters that closed the intersection of Main Avenue and College Drive during an Inauguration Day protest Friday. Charges were dropped Friday against an assistant professor at Fort Lewis College accused of organizing a protest without a permit and obstructing traffic during the event. Durango city prosecutor David Liberman said it would have been costly and time-consuming to pursue the case against Anthony Nocella, who was cited with parading without a permit and obstructing streets during the Jan. 20 protest marking the inauguration of President Donald Trump. Fines would have been about $200, he said, but it would have cost the city much more to pursue the case. Nocella’s attorneys, which included lawyers for the American Civil Liberties Union of Colorado, requested voluminous amounts of “discovery” in the case, which included documents and 50 to 60 hours of video captured by police officers’ body cameras. Reviewing those videos and providing them to the defense wasn’t possible before trial, which was set to begin Wednesday, Liberman said. The case wasn’t without merit, he said. It would have been easy for Nocella to obtain a permit to parade, which helps protect the health, safety and welfare of the public, Liberman said. “I think we had a case,” he said. Nocella said the city’s case was flawed. He denied organizing the protest or obstructing traffic. The protest came together almost organically by multiple individuals, he said. In fact, similar events were held across the country where organizers didn’t obtain permits. And Nocella helped direct traffic, not block it, he said. At the time, police thanked him for his help, he said. They never asked him to disperse or stand on the sidewalk. Nocella believes he was cited after two types of people called police: Trump supporters who wanted to see someone held accountable, and drivers who were inconvenienced by the 150 marchers who blocked roads in downtown Durango. Nocella teaches sociology and criminology, peace and conflict studies, gender and women’s studies, and environmental studies at FLC. 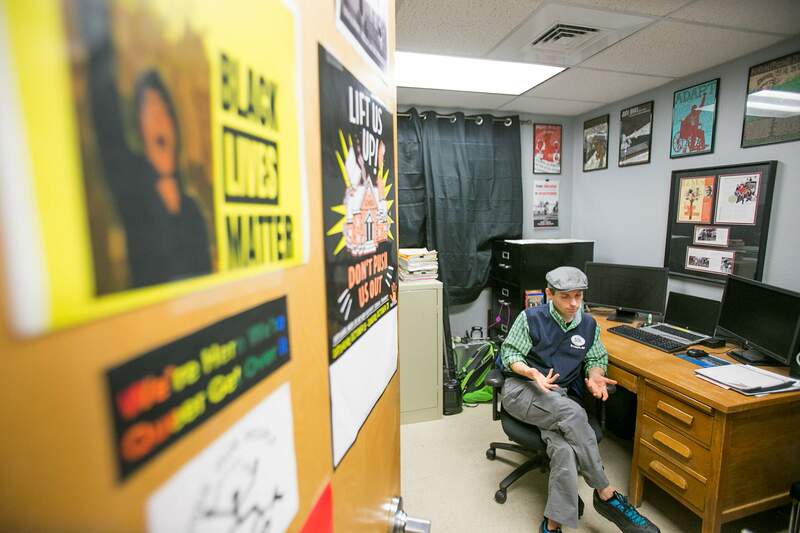 In his role as a professor, Nocella has encouraged students to be socially active and participate in public demonstrations to bring awareness and social change. He has helped spread the word and facilitate events around Durango and the region. In November, he accompanied students to Standing Rock in South Dakota to protest against the Dakota Access Pipeline. Mark Silverstein, legal director of the ACLU Colorado, said the city’s case against Nocella was indicative of selective prosecution and seemed like retaliation for Nocella’s activism. “For that reason, we wanted to get involved in order to protect the First Amendment, and protect the First Amendment rights of not only Mr. Nocella, but also other Durango residents who might want to participate in future demonstrations without fear of an unjustified prosecution,” Silverstein said. A Durango municipal judge denied Nocella’s request to have his case heard before a jury, saying city ordinances don’t guarantee jury trials to defendants charged with petty offenses when no jail time is being sought. Silverstein said that appears to be in violation of state law. He was prepared to file a motion for reconsideration, but the city prosecutor dropped the charges before the motion was filed. Silverstein said the ACLU plans to have further discussions with the city about its ordinance denying defendants jury trials. Nocella said he’s pleased charges were dismissed, but it’s the beginning of a larger conversation with the city of Durango and local police. Police need to learn how to better interact with students who want to hold nonviolent demonstrations and understand that activism isn’t run by a single person, or even a few, he said. “There are so many co-sponsors of different events, as well as random people that can create an event just by having a Facebook,” Nocella said. “Some of the largest rallies in the last five years have not come from a traditional organization or 501(c)3 or an agency, but came from the will of just one or two people via Facebook, and then that Facebook was shared or went viral.